Samsung currently takes a different approach than that of Apple when it comes to product retailing. Instead of costly, dedicated stores, Samsung has pop-up areas in shopping malls and dedicated areas in Best Buy(s bbuy) locations. The hiring of Gudgel signals a possible change in that strategy. Samsung arguably has plenty of retail products to support a full store-front at this point, moving well beyond computers, monitors and appliances to a plethora of mobile devices, connected wearables and new accessories. Gudgel is actually the second former Apple retail resource snagged by Samsung: Earlier this year, Michael Forrest joined Samsung according to The Information, where he’s been working on a plan to merge the Samsung Galaxy brand with a retail experience. It’s a smart move as the Galaxy line started out in 2010 as Samsung’s interpretation of a single device line, similar to that of Apple’s iPhone. Of course, the difference here is that Galaxy is a line of branded devices that vary widely, unlike Apple’s few products to meet many needs. 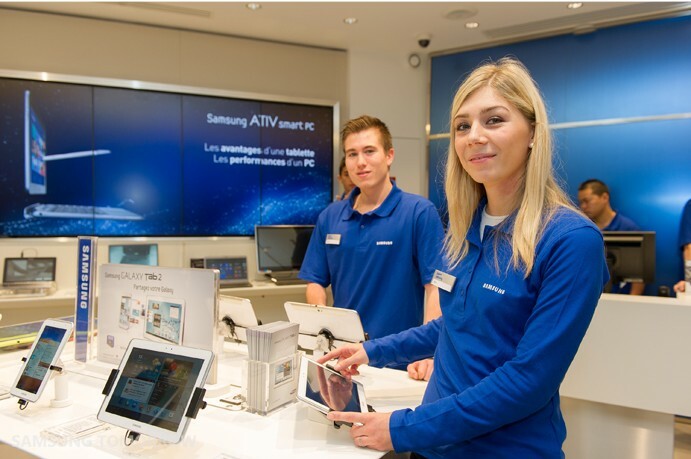 That’s where the challenge lies with Samsung’s new retail specialists: Getting consumers to believe that multiple Galaxy products work best together, thereby increasing overall product sales for Samsung. Why bother linking to The Information if people without the free sub that Om’s receiving can’t view it? Brent, I completely understand your point. We actually paid for a subscription though; this isn’t a free sub for us. Of course that doesn’t help you or others who would like to see the content, which I can appreciate, but that’s The Information’s business model, which we don’t control. In this case, they broke news that nobody else had so they had to be the primary source for this post. If Microsoft can copy Apple, then so can Samsung. Of course, there will be the pundits saying Apple is now going to have stiff competition breathing down its neck and needs to be on guard. The way I see it is that Apple has slightly over 400 retail stores around the globe, so it will take an awful lot of catching up on Samsung’s part and there’s no guarantee any of those Samsung retail stores will pull in customers like Apple does. Samsung doesn’t need retail stores and they don’t need the overhead of running them. It’s really amazing the lengths Samsung will go to take Apple down. Apple still has a few things that Samsung can’t copy overnight. Samsung is doing pretty well with their smartphone business but they’re getting a bit too greedy in trying to run Apple out of business.